Seven years ago, an unknown Kazakh fighter based in Germany flew out to Big Bear, California and sparred with a 20-year old Mexican prodigy. Rumor has it that the latter took a couple of damaging hits. Now, the lives of those two prizefighters have intertwined again, although, this time they’ll exchange punches in a totally different setting. 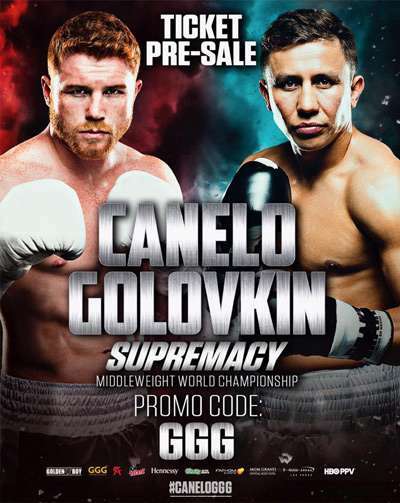 On September 17, 2017 (Manila time) at the T-mobile Arena in Las Vegas, knockout sensation Gennady “GGG” Golovkin and Mexican superstar Saul “Canelo” Alvarez will meet again in a bout aptly dubbed “Supremacy." It’s a match-up worth drooling over as it features two of boxing’s hardest hitters battling for the sole kingship of the middleweight division and a firm grip on the monetary side of the sport. Considering what’s on the line and how the combatants’ skill set stack up against each other, Golovkin-Alvarez is the one prizefight that could convert a non-fan into an avid follower or convince a disillusioned boxing head to rekindle the old flame. Forget the Mayweather-McGregor mismatch and the dud that was Mayweather-Pacquiao, this 160-lb collision is set to truly transcend the pugilistic sport. In contrast to the much-hyped Boxing-MMA crossover fight, wherein the thought of McGregor out-boxing Grandmaster Floyd was beyond the realm of possibility, predicting the winner of Golovkin-Alvarez is a tough call, which makes it a lot more exciting and interesting to watch. To casually throw out a prediction is just lazy thinking, given that the two pugilists involved are of high pedigree and are among the top 5 in major pound for pound lists. The truth is, the former amateur standout Kazakh and the battle-tested 27-year old are both armed with the right weapons to be triumphant. Yes, Gennady (37W - 0L – 33KOs) is the odds-on favorite, mostly because he is undefeated and he is the natural middleweight. But coming in, Canelo (49W – 1L – 1D – 34KOs) has a few significant advantages as well. Youth, quicker reflexes and hand-speed go to the Oscar De La Hoya protégé. His track record against power punchers is also something to take note of as his most definitive wins came off heavy-handed guys such as Kermit Cintron, Alfredo Angulo, and James Kirkland. Look at Alvarez’s rock solid physique in preparation for the mega-showdown and see if you can still say that Golovkin could simply outmuscle the young buck. As for Gennady, he can offset his adversary’s strengths by collectively utilizing his monstrous power, great timing, and methodical approach. With these facts laid out, can you honestly say that you know how this brewing war would play out? Mayweather-Pacquiao was called "The Fight of the Century" but it wasn’t much of a fight at all. It was forgettable, to be honest. The fireworks didn’t go off, mainly because Floyd and Manny met at the wrong time in their careers. By 2015, the Pacman was no longer the killer he once was and Money-May at that stage never bothered to entertain the audience as long as he got the W.
Golovkin-Alvarez, however, is a totally different story. Canelo, at 27 with 49 wins under his belt, is undoubtedly in his prime, making him a very dangerous, hungry redheaded beast. Meanwhile, the 35-year old Kazakh, although at the tail end of his physical peak, is still arguably the most powerful puncher today, along with the world’s top heavyweights. 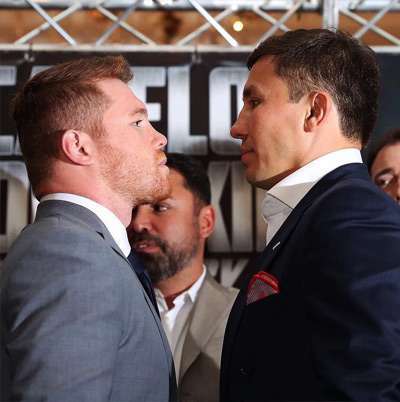 It’s important that Canelo and GGG have crossed paths while they still have more than enough ammo to churn out a classic slugfest or guarantee a victory with a picture-perfect knockout blow that will surely be watched a gazillion times on GIF form. The overwhelming physical prowess showcased in this prizefight makes very little room for a potential thriller to turn into a snoozer. Canelo is a strong boxer-puncher who’s not keen on keeping his hands to himself when he sees the opportunity to detonate. On the other corner is Golovkin, a predator that does nothing but move forward, working behind his well-timed jab as he looks for the kill shot. This style-clash has barnburner written all over it. 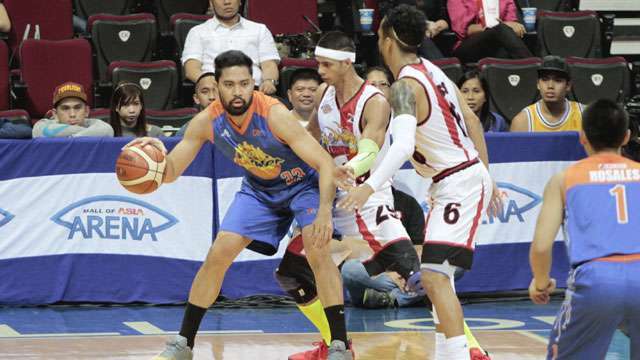 Dry moments may come, though, if Alvarez would apply a stick-and-move tactic to try and take advantage of his quickness. However, we believe the Mexican warrior in Canelo will force him to open up more often than not. There’s no way he’ll pull off a safe runaway victory a la Mayweather. On the flipside, we’ve got zero concerns with GGG, slowing the fight down. He’ll be on top of the ring, perpetually stalking his opponent, always ready to throw haymakers. A meeting between these two tough guys is obviously tailor-made to please the crowd. They’ve got sturdy chins, Golovkin and Alvarez. Legend has it that, GGG has never been knocked down, while Canelo has only been visibly hurt once, back in 2009 when he ate a left hook, going up against Jose Cotto (Miguel’s big bro) as a 19-year old work-in-progress. With skull durability as one of their best assets, we might see Canelo and Gennady trade bombs on a number of occasions all throughout match. And if they feel that they could take each other’s punches, they might decide to close the show by letting their fists fly with reckless abandon. Witnessing both fighters get floored multiple times en route to a razor-thin decision is also not out of the question. With such possibilities looming, this square-off could really be one for the ages. A convincing win for Canelo will not only get him Golovkin’s 4 middleweight belts (WBA, WBC, IBF and IBO), but it will also take his stardom to Mayweather-Pacquiao territory. Plus, outlasting one of the most fearsome figures in boxing will seal his reputation as a bona fide warrior, even to his harshest critics. An Alvarez loss, though, would unfairly tag him as “a pretty boy who’s been protected by his promoters from real fights”. As a result, he will lose ground on becoming boxing’s next biggest star. In the champion’s side of things, the Kazakh slugger’s legacy is also at stake along with the eye-popping checks in his future fights, should he lay waste to Canelo. Defeating Alvarez would make Golovkin a household name and he’ll be looked upon as the real deal. But an L would be the complete opposite, as it would reduce GGG’s almost demigod image to someone who only stops mid-tier boxers, unable to deliver when it mattered most. 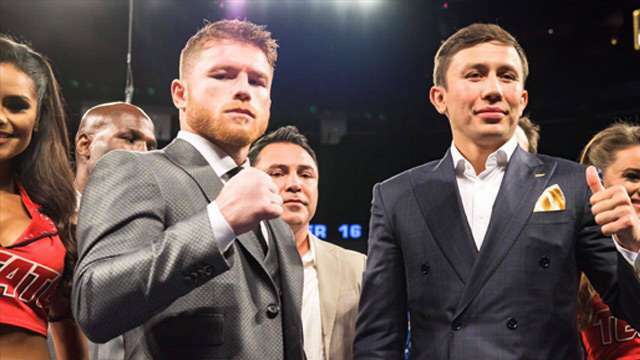 The pressure on Canelo and Gennady to show up is immense, thus both will go all out to pull off a signature performance. We know we practically said that it’s not smart to make predictions for this middleweight confrontation, but watching it wouldn’t be as fun without giving a fearless forecast. Because we feel that Canelo isn’t impossible to hit and Gennady’s power is such a game-changer, we’re inclined to lean on GGG scoring a KO in the late rounds. We wouldn’t be surprised if Canelo’s combinations get the better of Golovkin, ultimately allowing the challenger to escape with a close decision victory. Nah, scratch that, we’re sticking with GGG via late round KO.